I made this Valentine's Day card for my grandson. This is an A2 size card (4 1/4 x 5 1/2"). The white cardstock is Close To My Heart's (CTMH) White Daisy. 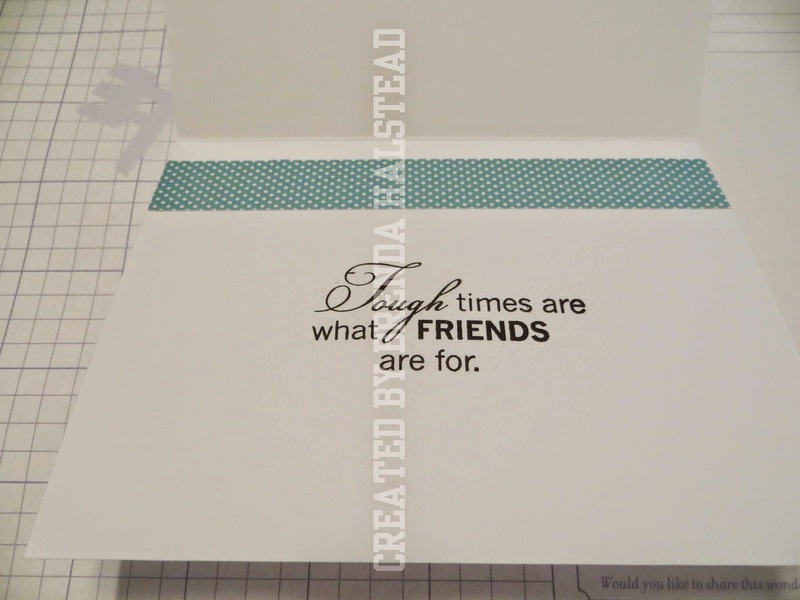 The patterned paper is from CTMH's Heartstrings Paper Pack. The patterned paper for both the front and inside of the card is cut at 4 x 5 1/4". The White Daisy cardstock layer for both the front and inside of the card is cut at 3 x 4 1/4". 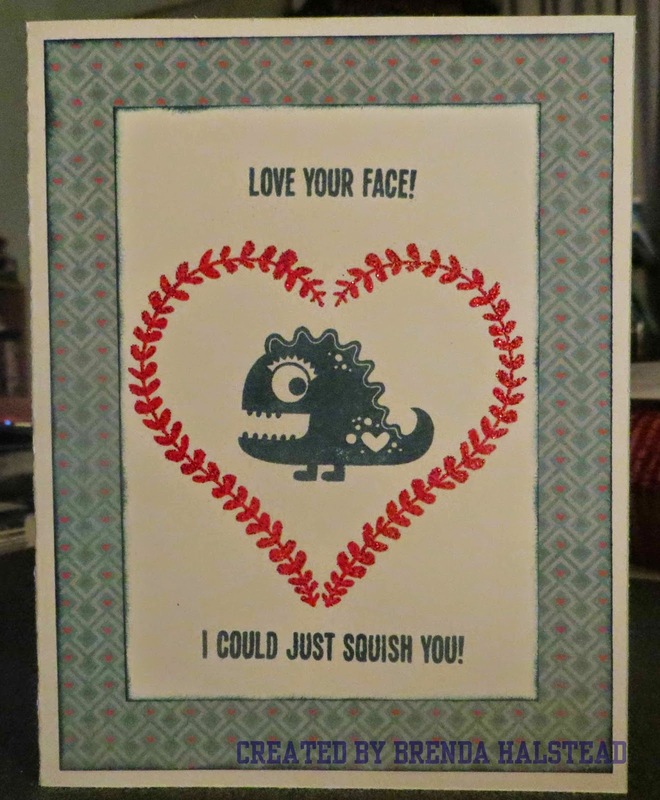 The heart on the front of the card and the sentiment & heart on the inside of the card are from the CTMH Workshops On The Go Heartstrings Cardmaking Kit and the dinosaur and sentiments on the front of the card are from the CTMH Love Ya Silly stamp set. The dinosaur and all sentiments were stamped using CTMH's Indian Corn Blue Exclusive Ink Pad. 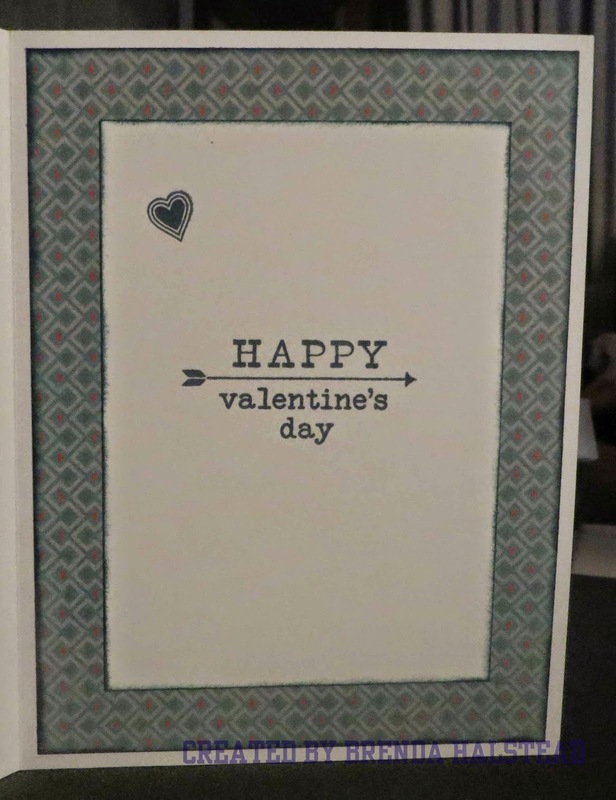 The heart on the front of the card was stamped with a Versamark Ink Pad and then I added red embossing powder and used my heat gun to emboss. I also inked the edges of the pattern paper and White Daisy layers with Indian Corn Blue. 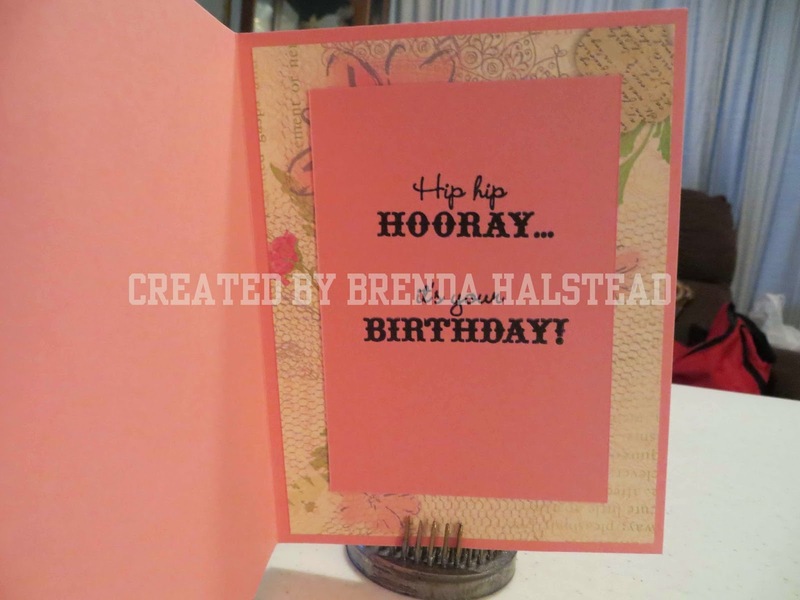 If you'd like to purchase the products used on this card, or any other Close To My Heart products, please visit my website at http://brendahalstead.ctmh.com/. I made this birthday card for a friend's daughter's birthday. This is an A2 size card (4 1/4 x 5 1/2"). 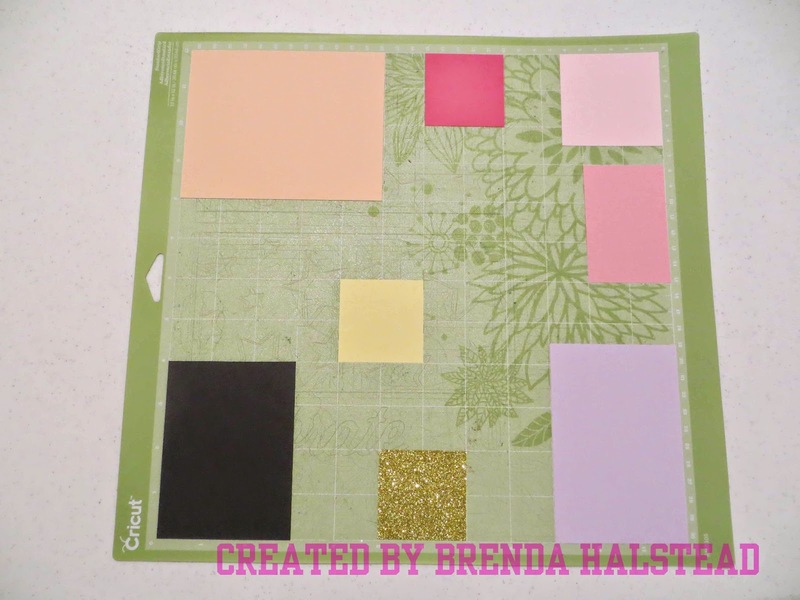 The base is Close To My Heart's (CTMH) White Daisy cardstock. 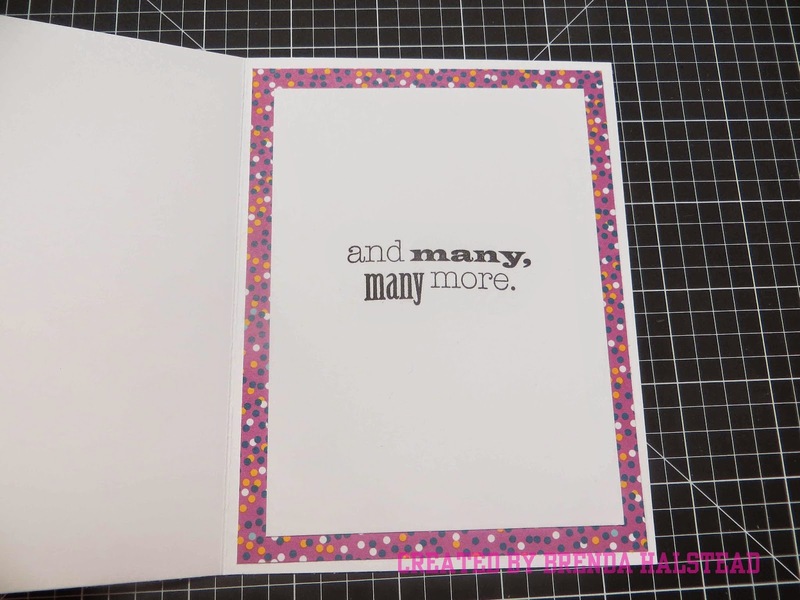 The patterned paper is CTMH's Confetti Wishes and is cut at 4 x 5 1/4". The white mat on the front of the card is CTMH's White Daisy and is cut at 3 3/4 x 4". The white mat on the inside is CTMH's White Daisy and is cut at 4 x 5 1/4". 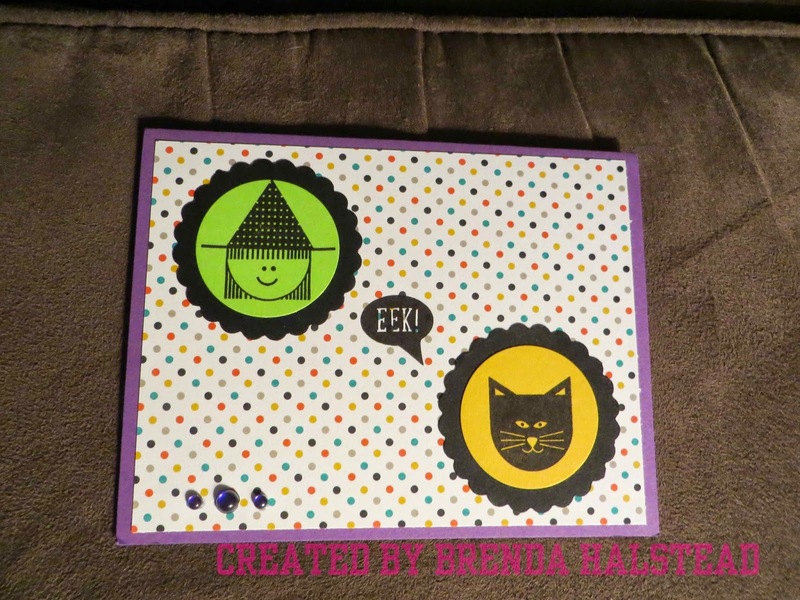 I used CTMH's December 2014 Stamp of the Month - Cutie Pie to stamp the cupcake and cupcake stand. I use CTMH's ShinHan Touch Twin markers to color the cupcake and stand. I used CTMH's Card Chatter - Birthday stamp set (which is retired) for the sentiment on the front and inside of the card. The rhinestones on the front are Queen and Co., which I colors with a CTMH's ShinHan Touch Twin marker. If you are interested in purchasing any Close To My Heart products, you can visit my website at http://brendahalstead.ctmh.com/. 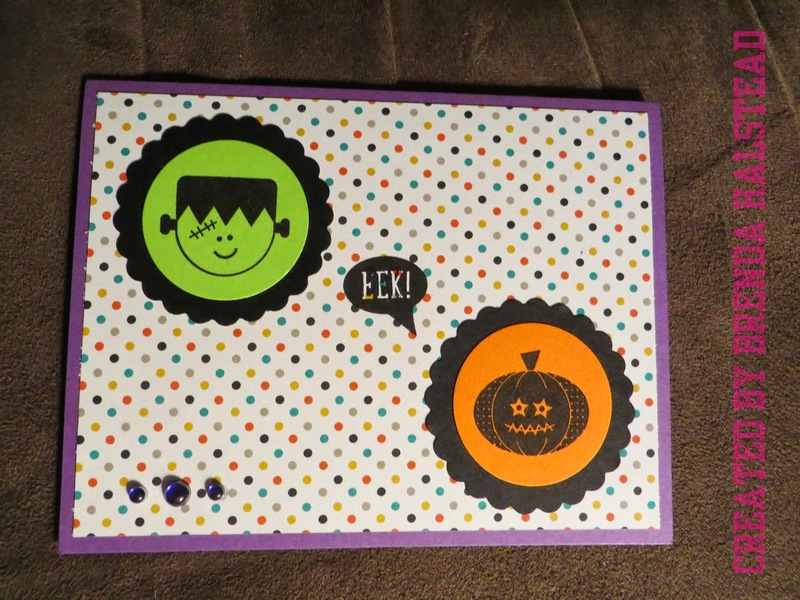 I made these Halloween cards using the Close To My Heart Trick or Treat Sweets stamp set. 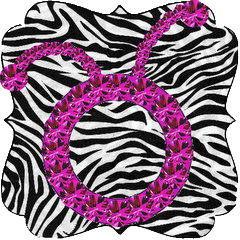 It is an a2 card measuring 5 1/2 x 4 1/4", with the patterned paper layer measuring 5 1/4 x 4". The patterned paper is from my stash and all solid cardstock is recollections. I used a friend's punches to punch the circles and scallop circles. The images were stamped with Close To My Heart's Archival Black Exclusive Ink pad. The bubbles are from Queen & Co. 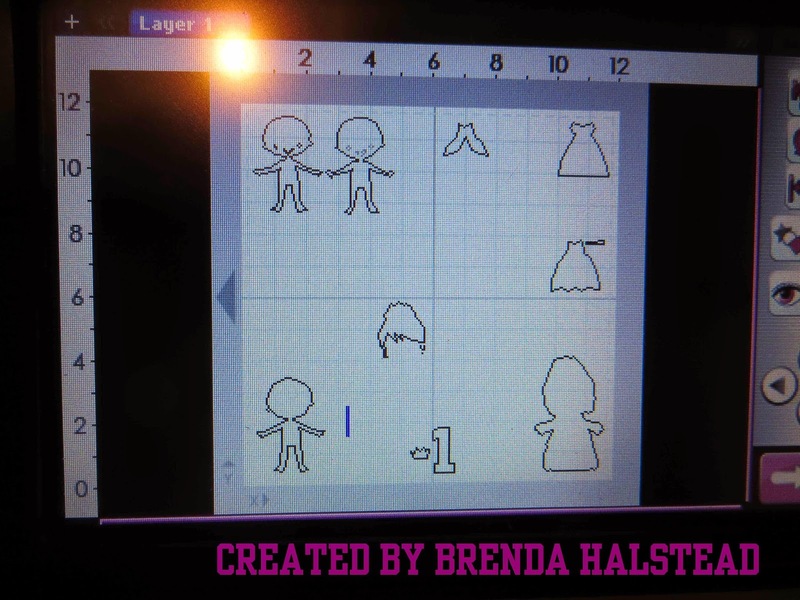 If you'd like to purchase this stamp set, or any other Close To My Heart product, please visit my website at http://brendahalstead.ctmh.com/. I made this card for a friend's daughter's 1st birthday. I used the Create A Friend and Birthday Bash Cricut cartridges. The card is an A2 card (4 1/4 x 5 1/2"). All solid cardstock is Recollections, the patterned paper is a retired Close To My Heart paper and the gold glitter cardstock is from Hobby Lobby. The sentiment is from the Stamps of Life candles4birthday stamp set. The pearls are from Queen & Co.
Hello, and thank you for stopping by my blog! I have two cards I'd like to share. The first is a birthday card I made for my daughter, who loves owls! This is an A2 size card (4 1/4 x 5 1/2"). All solid cardstock is Recollections. The patterned cardstocks are from my stash. The patterned cardstock layer on both the front and inside of the card measures 4 x 5 1/4". The green layer on the front measures 3 3/4 x 5", and the green layer on the inside measures 3 1/4 x 4 1/2". 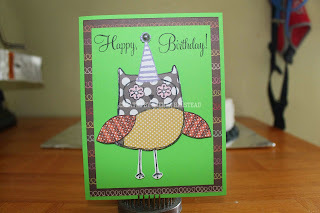 I used the Close To My Heart August 2014 Stamp of the Month (What A Hoot) to make the owl, and used the Card Chatter - Birthday stamp set, which is retired, for the sentiment. I used Close To My Heart's Archival Black Exclusive Ink Stamp Pad (item # 44751) to stamp the owl and sentiment. I added small rhinestones to the owls eyes. The second card is a sympathy card for a dear friend. This is also an A2 size card (5 1/2 x 4 1/4"). The white cardstock is Close To My Heart White Daisy (item # 1385) and the patterned cardstock was in my stash. The patterned cardstock layer on the front measures 5 1/4 x 4", and the white cardstock layer on the front measures 5 x 3 3/4". I used the Close To My Heart June 2013 Stamp of the Month (A Flowering Bunch) to stamp the flowers and used Close To My Heart's Words of Comfort stamp set, which is retired, for the sentiment. I used Close To My Heart's Archival Black Exclusive Ink Stamp Pad (item # 44751) to stamp the image and sentiment. I added Queen & Co. pearls to the front. 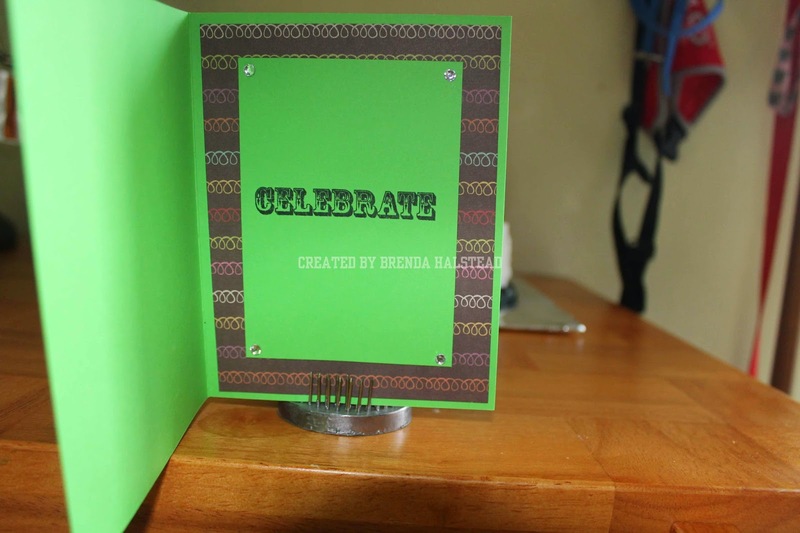 On the inside of the card, I used a strip of the patterned cardstock, which measures 5 1/2 x 1". I hope you enjoyed my cards. 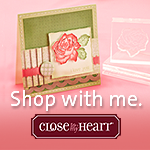 If you would like to purchase Close To My Heart products, please visist my website at http://brendahalstead.ctmh.com/. I'd love to have you as my customer! Also, if you'd like to become a Close To My Heart Independent Consultant, visit my website, hover your mouse over What We Do and then click on Be A Consultant from the drop down menu. I'd love to have you on my team! 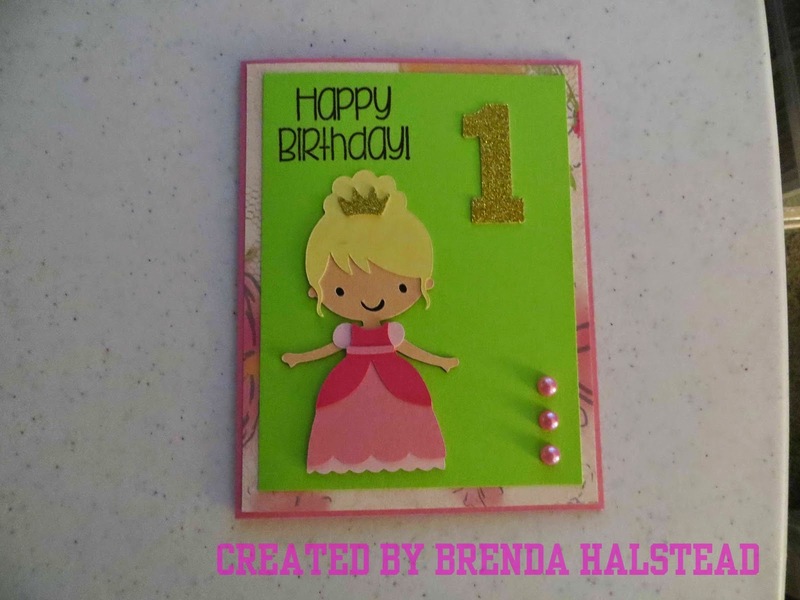 My granddaughter's 1st birthday party was this past Sunday, and here is the card I made for her. This is an A2 size card (4 1/4 x 5 1/2"). The base and all solid cardstock is Recollections. The patterned paper is Lucy (a retired Close To My Heart (CTMH) B&T paper pack). For the front of the card, the patterned paper layer measures 4 x 5 1/4". 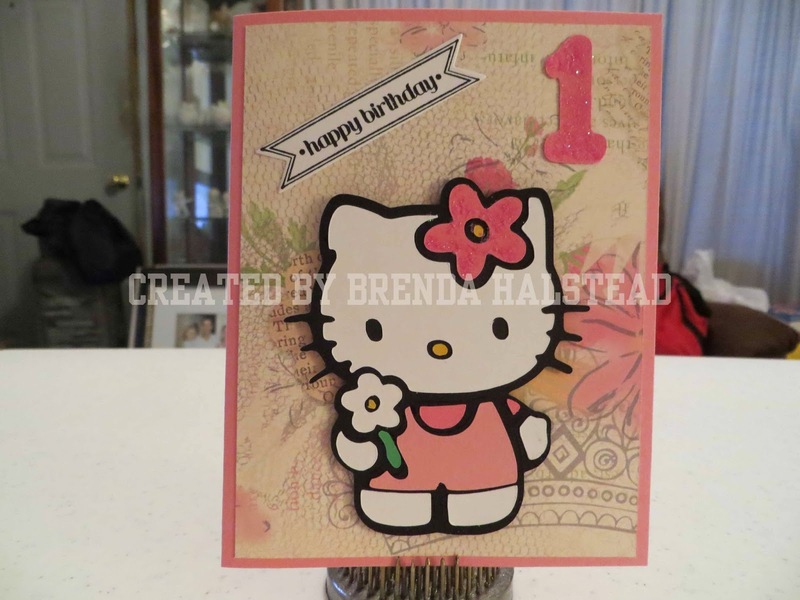 I used the Hello Kitty Greetings Cricut cartridge to cut Hello Kitty at 3 1/2", I used the Hello Kitty Font Cricut cartridge to cut the number 1 at 2" and I used the Stampin' Up! Bitty Banners stamp set and CTMH Archival Black exclusive ink pad for the sentiment and cut it out using the coordinating die set and my Cuttlebug. I used Recollections glitter on the flower on Hello Kitty's head and the number 1. 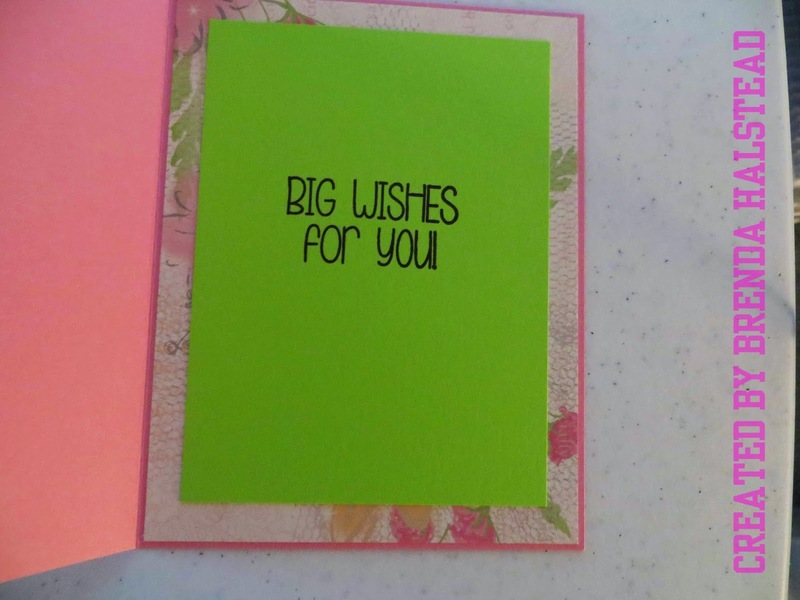 For the inside of the card, the patterned paper layer measures 4 x 5 1/4" and the solid layer measures 3 x 4 1/4". 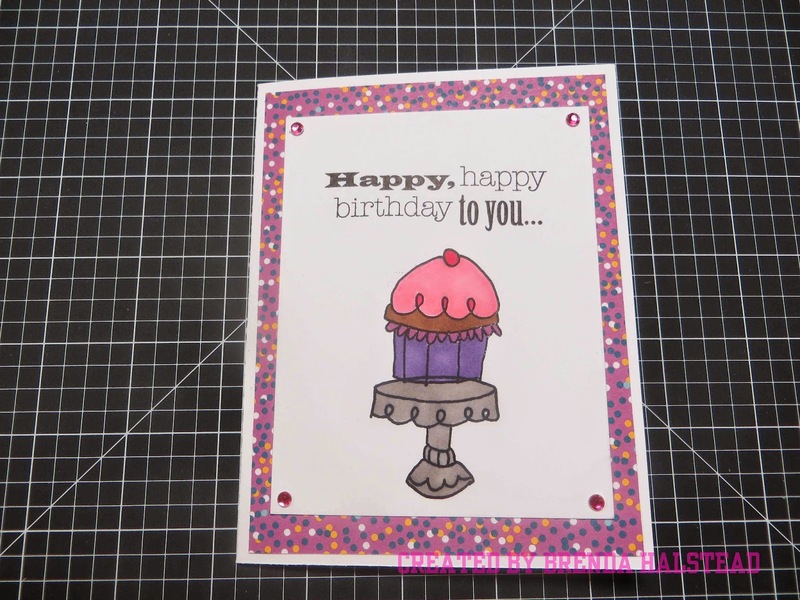 I used CTMH's retired Card Chatter - Birthday stamp set and CTMH's Archival Black exclusive ink pad for the sentiment. If you are interested in purchasing any CTMH products, or sign up to be an Independent Consultant, please visit my website at http://brendahalstead.ctmh.com/.